Famous wine-growing community (Bernkastel area) in the German wine-growing region Moselle with about 1,200 inhabitants. It was formerly called "Dusemond", whereby this name derives from the Roman name of a vineyard as "dulcis mons" (Latin for "sweet mountain"). In 1925, it was renamed to promote the famous locations in Brauneberg. The total vineyard area is over 300 hectares. Here are among other things the two famous individual layers Brauneberger Juffer and Juffer sundial who were already the French Emperor Napoleon Bonaparte (1769-1821) to the pearls of the Moselle region. 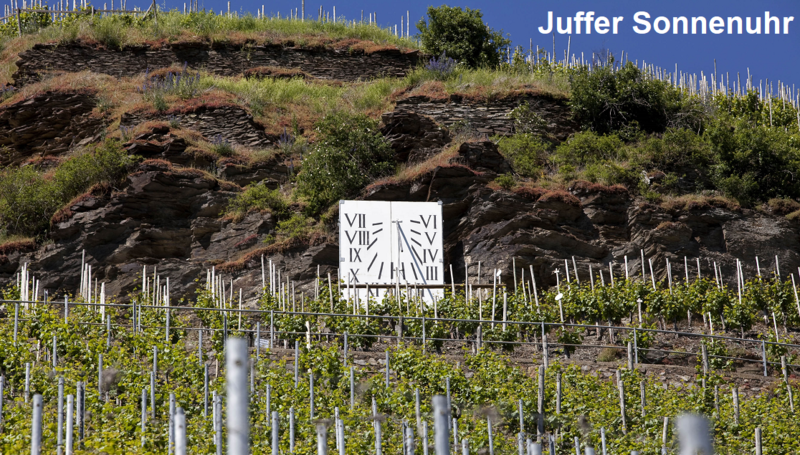 The name "Juffer" goes back to the vineyard ownership of nuns of the former Franciscan monastery. These were popularly called in the Rhineland dialect "Juffen" (virgins, Betschwestern or bigots). According to another version, the name derives from three unmarried, ie "maiden" remained daughters of a former owner - in the Mosel-Frankish dialect "maidens" are referred to as "Juff". The other individual layers in the community are chamber. monastery garden and almond ditch. This page was last modified at 1 July 2017 at 19:08.